Just in time for a new season, and in the midst of the Cascadia Cup TM debacle, we’re excited to announce a new batch of Cascadia Scarves has arrived. These scarves are sturdy, well made, nice and long and absolutely perfect for guarding your lungs from flare smoke, or for representing Cascadia wherever you might end up. Great question, let us check on that and we’ll get back to you, either here or through Facebook. Well I tried to buy the scarf and it seems that everything went fine (among the shipping countries there was there was Italy too, so I presume that it is ok). The only thing, I think that shipping fees will be higher, anyway just let me know and I’ll pay the difference.Thanks! Hi Jon, I don’t see your information in our sales history so it might not have gone through correctly. If you end up ordering twice, we’ll make sure to correct the information/refund the money. Ordered mine last week – can’t wait!! I’ve purchased a scarf, but there’s no-where to indicate when you’ll be shipping these, if it can be tracked, or what have you. Hi, we’ll be starting to ship these next week. If you’re order went through, you’ll be getting a scarf! Have these shipped? Will we be getting tracking information emails? Just to doublecheck, the purchasing confirmation you are talking about is the email I received from wepay.com, correct? That’s correct! This is our first attempt at ‘selling merchandise’ so it’s a bit roughshod at the moment. In the future hopefully we’ll get a bit better with the confirmations/invoices and what not. But if you get the confirmation, know that your scarf is on it’s way to being shipped out! Cool! It’s a long way to Siena, Italy, but I am sure you can make it, I’m positive!!! Hi there, just a uick info: have you already shipped the scarves? Did you have to pay something else for shipping fees for my scarf (I live in Italy, and I am not sure if $3 will be enough for Italy too)?In case of problems please let me know via mail or via this site! I came upon your scarves in the past and tried to get a hold of you about this but I had no luck for some reason. I run the people’s republic of portland apparel line. 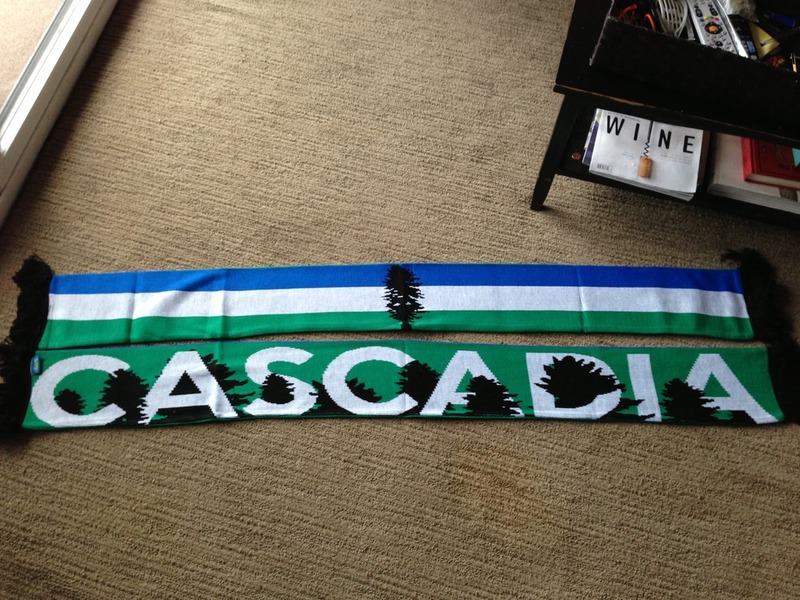 Within the last year I started selling the Cascadia flags off of it then a few months ago we created a website specifically for the cascadia flag http://www.cascadiaflag.com/ and I’d love to be able to sell your scarves off of it as well as off of the people republics site in the Cascadia section http://thepeoplespdx.com/cascadia/. With joint efforts like this I believe we can help spread the meme of Cascadia faster. Are you interested in talking about this in further detail. Hi Jen, yes we’d be happy to coordinate around this. I’ll meet with our other folks coordinating this run, and see what we’d like to do. So, my girlfriend bought me one for my birthday in mid/late January, just wondering when I could be expecting it. Hello, I purchased a scarf on January 19, and received a WePay receipt. I have not received any further communications regarding this scarf and it is approaching one month. Can I have an update please? Hi. These should have all been shipped by mid February. Hopefully it will arrive soon. In the meantime however, I’ll double check with the fellow who’s shipping them to make sure it’s been sent. If you’d like to send more detailed information to cascadianow@gmail.com that’d be welcome since this doesn’t have your name or email. I’ve got it!!!!!!!!!!!!!!! !It’s a beautiful scarf, I will proudly wear it! The order link says 3 available but sold out. ??? When will more be available?